Welcome! Lock it or lose it. The contrast between these 2 signs struck me as funny. 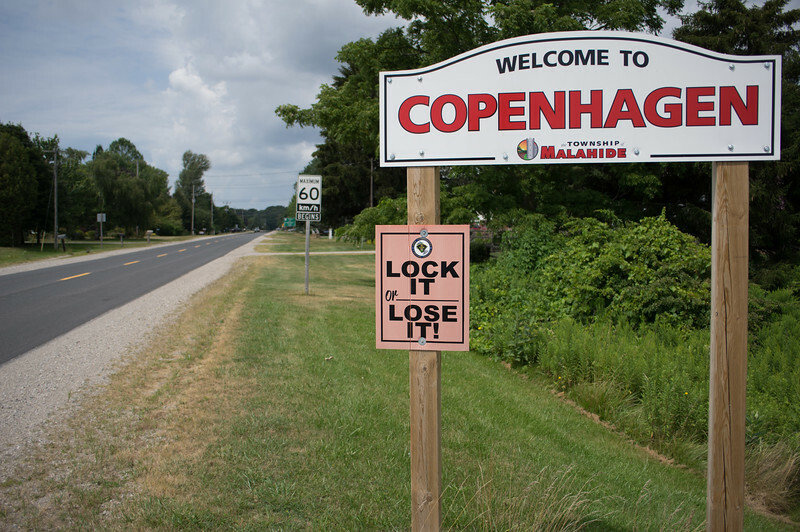 The "lock it or lose it" sign is part of an OPP (Ontario Provincial Police) promotion, not a bad idea at all, however, I would question whether this is really the best place to put this sign. Am I welcome, or not? If I was in the market for a house, would I want to consider this village? Clearly, this was not an intentional plan, and I think that's part of the reason that I had to grab this shot. Intentionally funny signs are fun (google funny church signs), but to me, the unintentional ones bring it to the next level.. I'm reminded of another sign that I saw, back in my high school days. It was 40-ish years ago, but as I recall, a store had a lighted sign suspended from a pole mounted straight out from a building. I don't know the name of the store, but the term "Safety Supplies" was in the name. For a couple of days, one of the mounts was broken, so the sign hung precariously from a single mount directly over the front door. This was long before cell phone cameras, it would have been a great humor shot. This time, when I saw these 2 signs together, I did stop, turn around and get the shot. So often I see glimpses of 'great shots' along the highway, and they live for a short term in my memory, cause I just won't stop and shoot. Cathy (my wife) often tells me at the beginning of a trip to stop if I see something, but I rarely do. Someday, I may learn that the joy of capturing and reliving these images may be as important as the objective to get to our destination, but as an male Engineering type, it may be a difficult thing to learn. Maybe the 'humor' shots will help me learn this. .